We offer several examinable syllabus classes in a variety of dance styles. Grade 11 and 12 students are able to gain high school credits towards graduation for passing dance exams. Founded in 1920 to set standards for dance teaching within the UK, today we have a presence in 79 countries, with 36 offices and over 14,000 members worldwide. We count more than 1,000 students in our teacher training program's and more than a quarter of a million students are being examined on our syllabi. We support our membership through the knowledge, and expertise of our highly qualified staff and through conferences, workshops, training courses and summer schools. The Royal Academy of Dance is one of the world’s most influential dance education organizations. Our exams set standards in classical ballet worldwide and we are a global leader in dance education and Continuing Professional Development for dance. The Imperial Society of Teachers of Dancing (ISTD) is one of the world’s leading dance examinations board. We cover the full spectrum of genres and for more than 100 years we have provided training for dance teachers and examiners, enabling them to enter their students for examinations, develop new techniques and spread the joy of dance. As a registered educational charity, the ISTD’s mission is to educate the public in the art of dancing in all its forms, to promote knowledge of dance, to provide up-to-date techniques for our members, and to maintain and improve teaching standards. We support and train our members through a wide variety of courses, summer schools and congresses, updated teaching syllabi and techniques upon which to train dancers for the profession. Celebrating 65 year of excellence, the CDTA BC Branch is a registered Society offering a wide range of certification programs for professional dance teachers and student examination programs in many disciplines. Offering the best in Highland dance since 1934, the Scottish Dance Teachers Alliance is founded in the UK with many members around the globe. The Acrobatic Arts program provides easy progressions to follow. Acrobatic Arts starts at the very beginning, we teach instructors everything they need to know about proper placement and technique so their students will have the building blocks to progress safely and quickly from one level to the next. 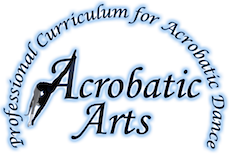 Acrobatic Arts Teacher Training and Certification courses provide extensive, hands-on training in spotting and progression so teachers leave feeling knowledgeable, confident and inspired to teach acro dance. Studios who continue with Acrobatic Arts Exams for their students will have continuous support, with adjudicator meetings offering feedback and suggestions to improve the studio’s acro program annually. Dancers who train through Acrobatic Arts have balanced development, are stronger, more flexible and fearless. Studios that implement thisprogram will see dancers with more skills, who have fewer accidents, and are less likely to develop chronic injuries.